The hotel offers comfortable, clean and safe accommodation with friendly and efficient service at a reasonable rate to travelers. Touch a nature and enjoy your vacation at Natural Beach Hotel. - Check out time prior to 12.00 noon. - No extra charge for children under 10 years occupying same room with adults. The Natural Beach Hotel offers luxurious, comfortable and safe accommodation with friendly and efficient services at a reasonable price. 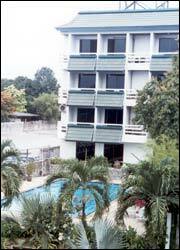 In The Sea View Building, all rooms have a magnificent view of Pattaya Bay. In The Main Building, you can select from the sea view or city view room with complete comfort of standard and deluxe rooms. You are invited to relax in the splendor of the surroundings and the capable attention of our friendly staffs. - Restaurant: We have Thai, American, Chinese and Japanese cuisine to serve you at Thai-Yo Restaurant.